Singapore-based Pacific Carriers said it has entered into an agreement with Dubai's ship building unit Drydocks World to acquire a 67 per cent stake in its Southeast Asian venture, Drydocks World-Southeast Asia (DDW-SEA). Drydocks World said the DDW SEA had recently completed a debt restructuring scheme in Singapore ahead of its shareholders agreement with Pacific, a fully-owned subsidiary of the Kuok (Singapore) Limited Group. 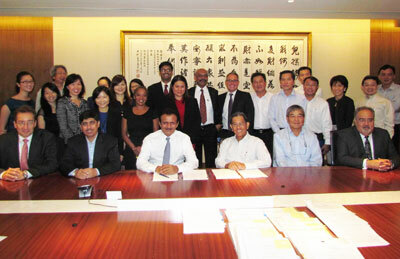 As per the agreement, DDW SEA will be renamed as DDW-PaxOcean Asia. As the holding company, the Pacific Carriers will take effective lead in providing management oversight of the new firm. The company has already named a new board of directors under the chairmanship of Khamis Juma Buamim, the chairman of Drydocks World & Maritime World. The partnership will also result in combined shipyard facilities with wide ranging capabilities, and a geographical coverage from the Middle East to East Asia, spanning the Indian & Pacific Oceans, said a DDW statement. The strong legacy brought by both partners will enable DDW-PaxOcean, to build and deliver jack-up rigs, semi submersibles, FPSO/FSRU and other sophisticated marine vessels, including repairs and conversions, it added. The day to day operational management of DDW-PaxOcean, comprising a shipyard in Singapore, 3 shipyards in Batam and a shipping division will be managed by the new team.